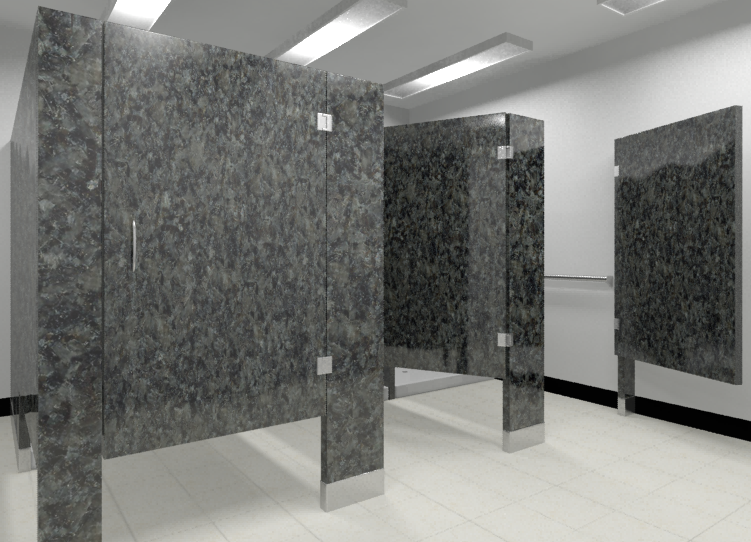 StonePly Stone Partitions are the perfect addition to upscale restrooms in hotels, retail stores, casinos, resorts, spas, office buildings, universities, townhouses, and condos. StonePly offers toilet partitions, urinal partitions, privacy partitions, shower partitions, and dressing room partitions. Choose from three elegant designs: floor to ceiling, floor and overhead brace, or ceiling hung stalls. With thousands of stone choices and a dozen stone finishes, StonePly stone partition panels are the perfect choice for your project. StonePly stone partition panels are lightweight and easy to install. The StonePly panels weigh only 3.5 lbs/sft compared to traditional stone which can weigh up to 27 lbs/sft. StonePly is mildew resistant which makes it great for shower compartments and partitions and toilet partitions. For more information please visit our applications website.